Whether layered or alone, this t-shirt is soft yet durable enough to stand up to your baby's playtime demands. 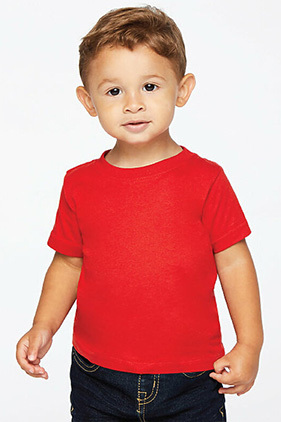 100% combed, ring-spun cotton 4.5 ounce super soft infant t-shirt. Topstitch ribbed collar supports the neckline to maintain the proper shape. Shoulder-to-shoulder taping reinforces the fabric to prevent overstretching, providing long lasting wear. Double needle hem sleeves and bottom for a clean, finished look. Side seam construction for exceptional quality and durability. EasyTear™ label for additional comfort and ability to brand as your own. CPSIA compliant tracking label in side seam. White is sewn with 100% cotton thread. (Heather 97/3).